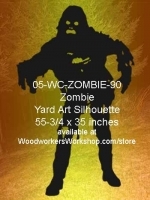 This monster zombie project would look great in the yard, on the porch, in a store window or anywhere you like! Choose to cut out and paint as little or as much detail as you want. Or use the silhouette to create your own characters! Use up some of that left over paint in your garage to paint on clothing. Use your creative side to have fun with the project! Custom sizing available upon request. A sheet of plywood measuring 35 x 54 inches. This is an easy pattern to use and it helps to have tracing paper to get the pattern onto the plywood. Thanks.